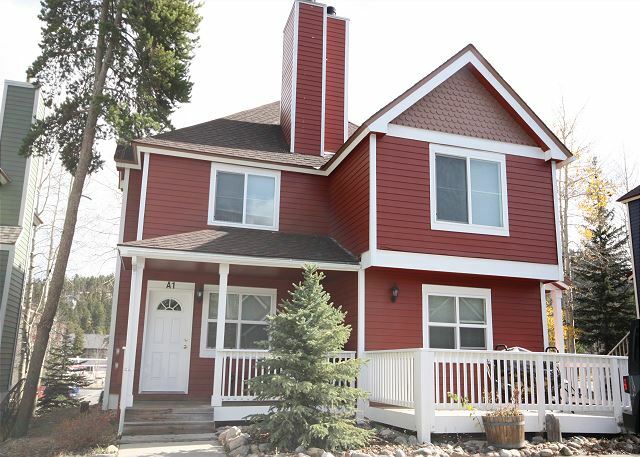 Charming townhome located in the Historic Victorian District, one block from Main Street Breckenridge, just steps away from shopping and restaurants. Each unit has a washer/dryer. The free bus shuttle stops at the property every 20 minutes. The townhomes were recently renovated with new furniture, carpets, tile floors, kitchen counter tops, flat screen TVs and new bedding. French Ridge is a small, charming property with 24 units. Most are two story. Upstairs is the Master Bedroom and private bath, a stack-able washer dryer, and a 2nd bedroom with a set of twin beds and own bath. Downstairs is an open floor plan with the kitchen, dining room, living room, fireplace and entrance to your deck. There are 2 garden level, single story units should you have difficulty with stairs. Loved the location! Stocked with all the comforts of home, esp. the washer/dryer. Only frustrating issue was parking - folks who were not staying in our quadrant parked there so it was a challenge to find a space at times. We appreciate your review! thank you for the feedback, parking can become difficult especially during snow storms or plowing hours and we apologize for any inconvenience that may have caused! It was the first time we came to Breckinridge to ski and we were there for a whole week including Christmas. PRO: the location was amazing it was close to the Main Street which was walking distance of the restaurants and all the shops. The place when we first arrived was clean and the rooms were spacious along with the closet to put ski gear etc. CONS: I didn't like that there was not a tub in the master bedroom because after a long day of skiing you come home cold and wanting to take a nice warm bath. There was also not a grill outside which held us back because we like to cool steaks and BBQ. The kitchen still needed some accessories as well. In conclusion I would recommend the place if you don't care for a hot tub and the grill. Other than that the place is nice. All was clean and staff was helpful. Walk to town &amp; grocery store - Great location! Loved the location! 2 days of maintenance during our stay was unacceptable (ripping off siding, banging, drilling, etc.) Good size for 4 people.